^ Sharad K. Jain; Pushpendra K. Agarwal; Vijay P. Singh (5 March 2007). Hydrology and water resources of India. Springer. pp. 334–342. ISBN 978-1-4020-5179-1. http://books.google.com/books?id=ZKs1gBhJSWIC&pg=PA334 2011年4月18日閲覧。. ^ McIntosh, Jane (2008). The ancient Indus Valley: new perspectives. ABC-CLIO. pp. 99–101. ISBN 978-1-57607-907-2. http://books.google.com/books?id=1AJO2A-CbccC&pg=PA99 2011年4月25日閲覧。. ^ Romila Thapar (October 1971). “The Image of the Barbarian in Early India”. Comparative Studies in Society and History (Cambridge University Press) 13 (4): 408–436. JSTOR 178208. "The stabilizing of what were to be the Arya-lands and the mleccha-lands took some time. In the Rg Veda the geographical focus was the sapta-sindhu (the Indus valley and the Punjab) with Sarasvati as the sacred river, but within a few centuries drya-varta is located in the Gariga-Yamfna Doab with the Ganges becoming the sacred river. (page 415)"
^ a b C. R. Krishna Murti; Gaṅgā Pariyojanā Nideśālaya; India Environment Research Committee (1991). The Ganga, a scientific study. Northern Book Centre. p. 19. ISBN 978-81-7211-021-5. http://books.google.com/books?id=dxpxDSXb9k8C&pg=PA19 2011年4月24日閲覧。. ^ Jain, Sharad K.; Agarwal, Pushpendra K.; Singh, Vijay P. (2007). Hydrology and water resources of India. Springer. p. 341. ISBN 978-1-4020-5179-1. http://books.google.com/books?id=ZKs1gBhJSWIC&pg=PA341 2011年4月26日閲覧。. ^ Gupta, Avijit (2007). Large rivers: geomorphology and management. John Wiley and Sons. p. 347. ISBN 978-0-470-84987-3. http://books.google.com/books?id=gXgyHLT_hwIC&pg=PA347 2011年4月23日閲覧。. ^ Dhungel, Dwarika Nath; Pun, Santa B. (2009). The Nepal-India Water Relationship: Challenges. Springer. p. 215. ISBN 978-1-4020-8402-7. http://books.google.com/books?id=cgYwDW13ILoC&pg=PA215 2011年4月27日閲覧。. ^ a b c Chakrabarti, Dilip K. (2001). Archaeological geography of the Ganga Plain: the lower and the middle Ganga. Orient Blackswan. pp. 126–127. ISBN 978-81-7824-016-9. http://books.google.com/books?id=OEZe-wAIiKIC&pg=PA126 2011年4月27日閲覧。. ^ Pranab Kumar Parua (2010). 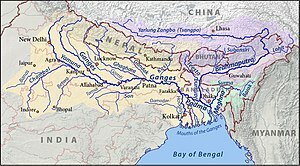 The Ganga: water use in the Indian subcontinent. Springer. p. 7. ISBN 978-90-481-3102-0. http://books.google.com/books?id=yUc7Cus2a-MC&pg=PA7 2011年4月26日閲覧。. ^ Catling, David (1992). Rice in deep water. International Rice Research Institute. p. 175. ISBN 978-971-22-0005-2. http://books.google.com/books?id=N5JxwKx1RAgC&pg=PA175 2011年4月23日閲覧。. ^ “Brahmaputra River”. Encyclopædia Britannica (Encyclopædia Britannica Online Library Edition ed.). (2011). http://www.library.eb.com/eb/article-48056 2011年4月25日閲覧。. ^ C. R. Krishna Murti; Gaṅgā Pariyojanā Nideśālaya; India. Environment Research Committee (1991). The Ganga, a scientific study. Northern Book Centre. p. 10. ISBN 978-81-7211-021-5. http://books.google.com/books?id=dxpxDSXb9k8C&pg=PA10 2011年4月24日閲覧。. ^ Salman, Salman M. A.; Uprety, Kishor (2002). Conflict and cooperation on South Asia's international rivers: a legal perspective. World Bank Publications. pp. 172, 178–187. ISBN 978-0-8213-5352-3. http://books.google.com/books?id=8GEr4fyDbqgC&pg=PA172 2011年4月27日閲覧。. ^ Salman, Salman M. A.; Uprety, Kishor (2002). Conflict and cooperation on South Asia's international rivers: a legal perspective. World Bank Publications. p. 133. ISBN 978-0-8213-5352-3. http://books.google.com/books?id=8GEr4fyDbqgC&pg=PA133 2011年4月27日閲覧。. ^ Arnold, Guy (2000). World strategic highways. Taylor & Francis. pp. 223–227. ISBN 978-1-57958-098-8. http://books.google.com/books?id=FarwCNdYdmoC&pg=PA223 2011年4月26日閲覧。. ^ Bhattacharji, Sukumari; Bandyopadhyay, Ramananda (1995). Legends of Devi. Orient Blackswan. p. 54. ISBN 978-81-250-0781-4. http://books.google.com/books?id=B0j0hRgWsg8C&pg=PA54 2011年4月27日閲覧。. ^ Abraham, Wolf-Rainer. “Review Article. Megacities as Sources for Pathogenic Bacteria in Rivers and Their Fate Downstream”. International Journal of Microbiology 2011. doi:10.1155/2011/798292. http://www.hindawi.com/journals/ijmb/2011/798292/.